Native soil? It probably doesn’t exist on your property. Is it a sign of these tumultuous times that even the peaceful, passive world of gardening can be embroiled in controversy? Perhaps it’s mere coincidence, but that doesn’t change the fact that a group of influential horticulture experts have stirred up a hornet’s nest surrounding that most basic of gardening components: soil. There is a popular Facebook page named The Garden Professors blog that has grown quickly to over 10,000 members, mainly gardeners but also a fair number of professionals in the horticulture industry. The page was created by a group of university horticulture professors, typically a good-natured, patient and tremendously astute bunch of scholars who provide research-based answers to common (and sometimes fascinatingly uncommon) gardening questions. I like it; rarely does one take a scroll and not find some bit of gardening expertise that is of interest. 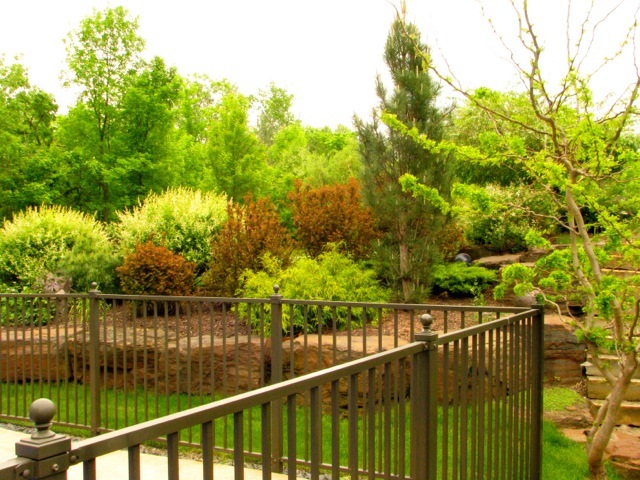 However, things became VERY interesting last summer, when one of the principal Professors decreed from on high that amending the soil in your yard prior to planting anything – trees, shrubs, perennials, annuals – is taboo. Don’t do it, the group announced: “Amending soil is not recommended in this group as it’s not science based information.” The soil that came with your property is the soil that came with your property. Accept it, but don’t deal with it. That this startling advice negates all prior practical and research-based university advice about amending soil (as needed) with organic materials such as peat moss, compost, manures, sand and organic chemical additives such as lime and soil sulfur, created a quite raucous debate on their Facebook page. Naturally I weighed in. Raucous? I’m there. Hold on a second, I posted, what if I want to grow Rhododendrons but the soil around my house is dense clay? I can plant Rhododendrons to my heart’s content, but they’ll whither and die within a year or two. 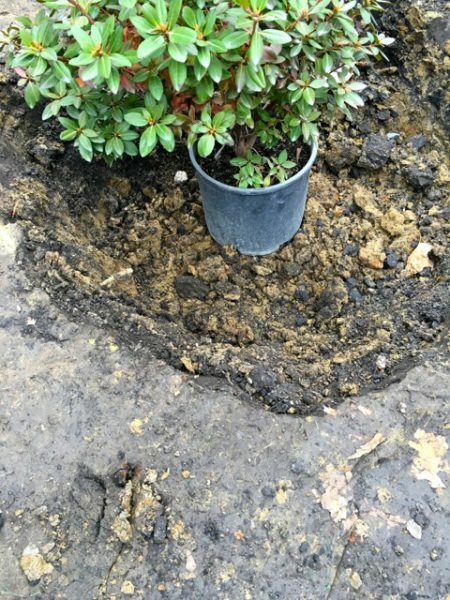 Soggy clay soil that doesn’t drain well will doom a Rhodendron. I proceeded to give the group my tried-and-true Rhododendron soil recipe: Dig a three-foot-wide, saucer-shaped hole, twenty-inches deep at the center. In a wheelbarrow, combine four parts pulverized black dirt, two parts peat moss, one part compost and a few shovelfuls of sharp sand. Sprinkle in a cup of soil sulfur for good measure. 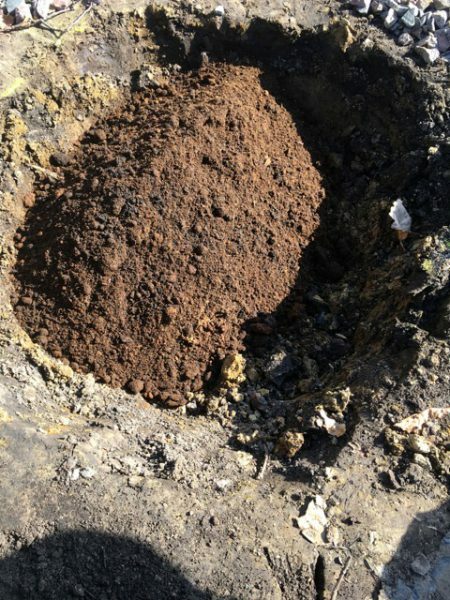 Dump this mixture in the hole and repeat until the hole is filled. Now you have soil in which to grow healthy, long-lived Rhododendrons. “You should choose the appropriate species for the site rather than attempt to change site conditions,” I was told by the de facto head of the Garden Professors group. Fine for some, I guess, except…what if a gardener wants to grow Rhodendrons and happens not to have loose, acidic, well-drained soil? 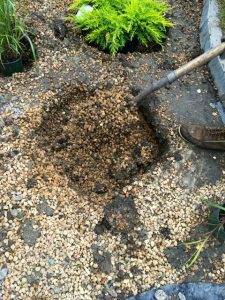 The only solution is a large hole filled with specially blended soil that matches the plant’s needs. Well, what about sandy soils, I asked? I’ve encountered numerous properties in my nearly twenty years of professional landscaping that contain these soils. Awfully difficult for a majority of trees, shrubs and perennials that the homeowners desire to prosper, unless the homeowner is willing to water these plants pretty much every day in summer. Even then most plants will encounter difficulty in the years ahead, since the soil has minimal organic content, restricting establishment of essential mycorrhizal fungi on roots. You guessed it – select plants that have adapted to sandy soils, was their advice. Objection to this new philosophy about never amending soil ran rampant during the discussion, of course, with gardeners, landscapers and even professional nursery growers from around the country weighing in with their opinions that not amending problem soils when planting is foolhardy, and ignores prior research and centuries of practical experience. Well, centuries of practical experience do not trump the latest university research, we were told. I even tried this angle, explaining to the group (originally four university horticulture professors, expanded to nine, except for some who have dropped out since they didn’t always agree with what the group was espousing) that in many situations where my company is hired to install a new landscape, there isn’t such a thing as “native” soil. Most often the soil surrounding the house and extending into the yard area is not the native topsoil. That’s been removed by the homebuilder and sold. What is used to grade around the house and yard is the excavation soil from the basement, often dense clay, or sometimes a gravel and sand mixture that the glaciers left eight to ten feet below grade. I once installed a major landscape surrounding a new home where much of the soil spread deeply across the property came from the excavation of the huge back yard swimming pool. Ribbons of native limestone were only ten feet below ground, and a soil test came back showing a pH of 11. No Zone 4 plant, native or otherwise, is going to lead anything but a miserable, brief existence in a pH of 11. So we excavated to a depth of three feet in every planting bed, hauled the junk soil out, and brought in 40 yards of blended garden soil. That was over 10 years ago, and it remains one of the healthiest, most disease- and trouble-free landscapes in my catalog. A portion of the new-home landscape where we removed soil registering a pH of 11. In homes without basements, builders will truck in loads of fill dirt, typically cruddy excavation dirt from some desolate building site elsewhere in the area. My point is, landscapers know all these soil facts; university professors sometimes don’t. In my raucous opinion, this new stance by a mere handful of select university horticulturalists smacks of an awfully narrow view of horticulture as it relates to the consumer. That this “no amending soil, limit your choices instead” decree runs contrary to free will and the legitimate desires of consumers – not to mention the billion-dollar nursery industry – are not factors worthy of consideration, apparently. My advice? In this case, ignore theirs. Grow what you want to grow. If the soil on your property is clay, or sandy, or otherwise poor, and what you wish to grow will not thrive (vegetables, for instance! ), research how to amend it, then do it. Rely on the research done by millions of gardeners, farmers, nursery growers and university researchers over centuries of trial and error. You should do fine.